I have been saving a few issues of 'In Touch' - the parish magazine of St James, as this often has various pieces of interesting information. In issue 43 (Summer 2006) it is written that "years ago, walking through the village, you'd be sure to hear the gurgling and trickling of little streams. Down by the church, along the Rocks Road, these miniature water ways always seemed to be full... Today, they are nearly always dry". This is fascinating. 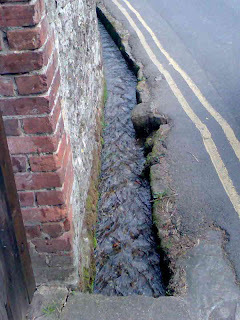 I was aware of the stream on the Rocks Road by the train station (which is very full at the moment as a result of all the rain - see picture), but not anything by the church. I would be pleased to hear from anyone who is aware of these streams, or any others, particularly if they have some photos! as well until is was covered over. I think I can give you the full course of this stream from when I lived in East Malling in the 50s. it started at a spring in Gillet's Hole (as the road was called then) and ran down the side of Rocks Road. Outside what was then Warner's Sweet shop, at the junction of rocks Road and Chapel St, it went underground and reappeared somewhere in the gardens of the houses on the right side of High St (going downhill). It was certainly above ground in the garden of The Vicarage. It came through the wall on the right side of Chuch Walk and immediately went underground again. If i remember rightly it surfaced roughly opposite the Research Station entrance on New Road. It then flowed down the park side of New Road for at least a couple of hundred yards. It was certainly in the open in the early to mid fifties, though it is now culverted. At some point it goes under New Road and then flows the other side of the wall separating Bradbourne grounds from New Road. Almost opposite Chapman Drive, right by where the "Blue Door" used to give access to Bradbourne, it joins the East Malling Mill Stream at the point where that stream flows under New Road. We've recently moved to East Malling and are lucky enough to have the stream running right through our garden. I can vouch for the fact that it's definitely full and flowing as we speak. I'm finding this blog really interesting and I hope to contribute something soon as I find local history fascinating.